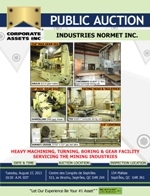 Corporate Assets Inc. | Industries Normet Inc. - Corporate Assets Inc. HEAVY MACHINING, TURNING, BORING & GEAR FACILITY SERVICING THE MINING INDUSTRIES FEATURING: VDF VM1250-NC, 52" x 163" heavy capacity CNC lathe; LEGOR 920, 93" x 320" heavy capacity engine lathe; NILES DL2 800 III 6300, 44" x 406" heavy capacity engine lathe; WMW NILES 40" x 200" heavy capacity engine lathe; CINCINNATI GILBERT 5" floor type HBM; TOS W100 table type HBM; TOS WH63 table type HBM; WMW 52" swing horizontal gear hobber; MAAG PH100 lead & involute gear checker; WMW HECKERT GFLV-250-2000 horizontal gear hobber and thread miller with 90" bed; WMW HECKERT 1250mm gear grinder; TOS 71 gear hobber; HAVLIK 40" slotter; HAVLIK 160" capacity gear hobber; SUNDERLAND IM60 gear shaper; INGERSOLL 30" x 168" planer mill; TOCCO induction heater; CARLTON 7' radial arm drill; ARCHDALE 5' radial arm drill; HUGE ASSORTMENT OF large capacity gear shapers, grinders, thread rollers etc…; LARGE MACHINING DEPARTMENT consisting of mills, lathes, drills, saws, grinders etc…; Heat treat furnaces, factory equipment & spare machine parts; HUGE ASSORTMENT of change gears, steady rests, machine tool accessories and attachments, tooling & more! ; PETTIBONE 15 ton boom crane; forklifts, welders and welding equipment, perishable & power tools and MUCH MORE!